In this 21’st century too many things have changed, right from our dressing style to eating habits. This world has seen lot of changes; there were some speculations on the constant changes of human’s lifestyle. China being a biggest market for food and fashion started trending blood bags as drinks. 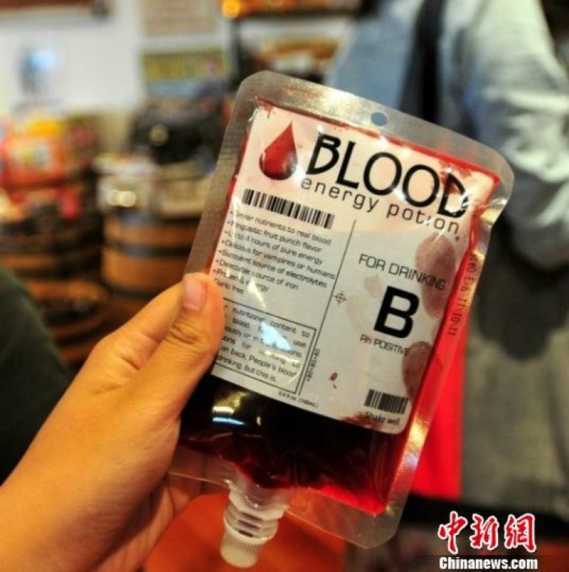 A considerate amount of youth in China got inspired by the famous American Television series Vampire Diaries, hence the retailers of china has started a innovative energy potion called as blood energy potion. Due to high demand of blood potion it is available everywhere and also has a facility of ordering it online. Many themed café have enchased this craze by arranging theme nights and events for the would be Dracula. One such café is recently opened in Liaoning and became a enormous hit by youths who fascinated popular Dracula and vampires who are popular in this genre. The staffs in this café are specifically dressed as doctors and nurses. These drinks are only available in plastic blood bags which include the details of all the blood types. The walls of the café have coffins designs and the background music played is inspired from various vampire theme shows and movies. The interesting part of this drink are the ingredients it has, well this special drink consists of very usual things like mineral water, coffee, white wine etc are colored and transfused to the blood bags before being served to the customers. With all the interest and inquisitiveness about the vampires, The American T.v. Series Vampire Diaries popularity in china makes this themed café more popular by the series fans. The B-type blood energy potion is available online. It is another popular blood bag drink which can be purchased online. The makers of B-type blood are going a step further and made the drink as blood like as possible. Blood B-type is advertised as the world’s first blood substitute beverage. The red concoction is been assume to have same nutrients, color and texture as blood, the only thing indifferent about is that it does not taste like blood. Looking at the current scenario in china it seems in near future, most of our younger generation would be running out on Blood drinks rather than cold drinks or alcohol in a party. It will be too early to say about drinks advantages and disadvantages, still thinking about the number of people involved in it we hope that this drink is nutritious for them.